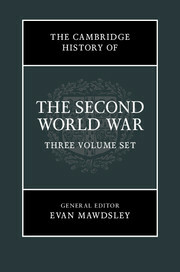 Gerade ist bei Cambridge University Press der Titel The Cambridge History of the Second World War in drei Bänden erschienen. Das Werk kostet £ 270,00. Wir freuen uns, Ihnen bis zum 31.05.2015 auf den Preis einen Bibl.-Rabatt von 20% gewähren zu können. The Cambridge History of the Second World War is an authoritative new account of the conflict that unfolded between 1939 and 1945. With contributions from a team of leading historians, the three volumes adopt a transnational approach to offer a comprehensive, global analysis of the military, political, sociological, economic and cultural aspects of the war. Volume 1 provides an operational perspective on the course of the war, examining strategies, military cultures and organisation and the key campaigns, whilst Volume 2 reviews the 'politics' of war, the global aspirations of the rival alliances, and the role of diplomacy. Volume 3 considers the war as an economic, social and cultural event, exploring how entire nations mobilized their economies and populations and dealt with the catastrophic losses that followed. The volumes conclude by considering the lasting impact of World War Two and the memory of war across different cultures of commemoration.